Greetings, Stampers! My sneak peek week continues and I have a few more new products to share with you. I received a second Stampin' Up shipment last night. Yes, I made two orders in less than a week. I'm all out of control with this new catalog! In it was a gorgeous hostess set called Simply Sketched and I immediately inked it up. I have to say that I think this is my favorite set out of the entire catalog and I couldn't wait to get my hands on it. It features three beautiful images and three very usable greetings. 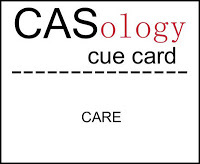 This card definitely has a clean and simple layout, and I thought it would be perfect to link up with the CASology cue card this week: CARE. If you're a follower of my blog, you know that I lost my Mom recently. I can't tell you how much it meant to me to receive a card in my mailbox, especially a handmade one, and to know that someone cared. So, with that on my mind I came up with this CAS sympathy card. 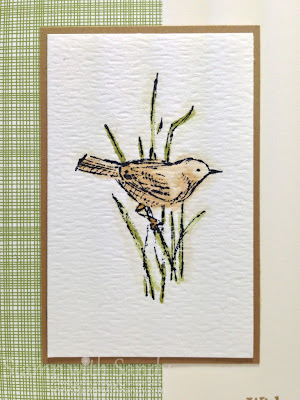 I just loved this little bird perched in the grasses, and he was screaming to be watercolored. I stamped the image on Watercolor Paper with Black Stazon Ink. I colored it in with an Aqua Painter and two new ink colors, Baked Brown Sugar and Pear Pizzazz. I used a little Sahara Sand ink to create a shadow. 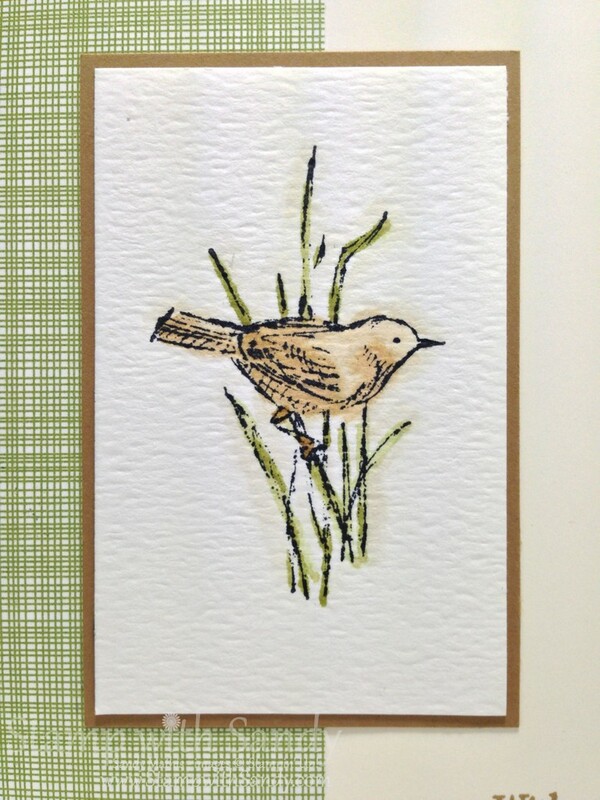 The simply patterned DSP is from the Gingham Garden Designer Series Paper pack. The new Stampin' Up Annual Catalog will be released on June 1, but you can get a copy from me now! Contact me here to request a copy, and I will Pay-Pal you an invoice for $5. The catalog is free from me to you; the $5 covers priority mail shipping. Or, the catalog is free with your first $50 order! Love your choices of the green from the Gingham Garden DSP, along with the Baked Brown Sugar, Pear Pizzazz, and Sahara Sand! Great take on the theme - I hope you'll link up at 52 Card Pickup this week! Beautiful image, a lovely card. Thank you so much for sharing with us this week at CASology! 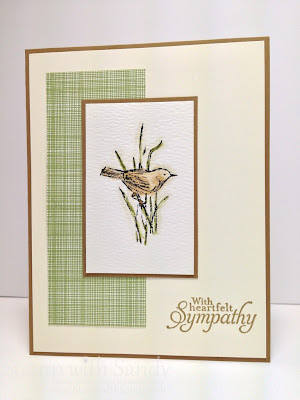 Cards are what we do, after all, so thank you, Sandy, for this caring inspiration for those times when we need sympathy cards. Beautiful water coloring and beautiful DP. I think your bird screams "winner!" 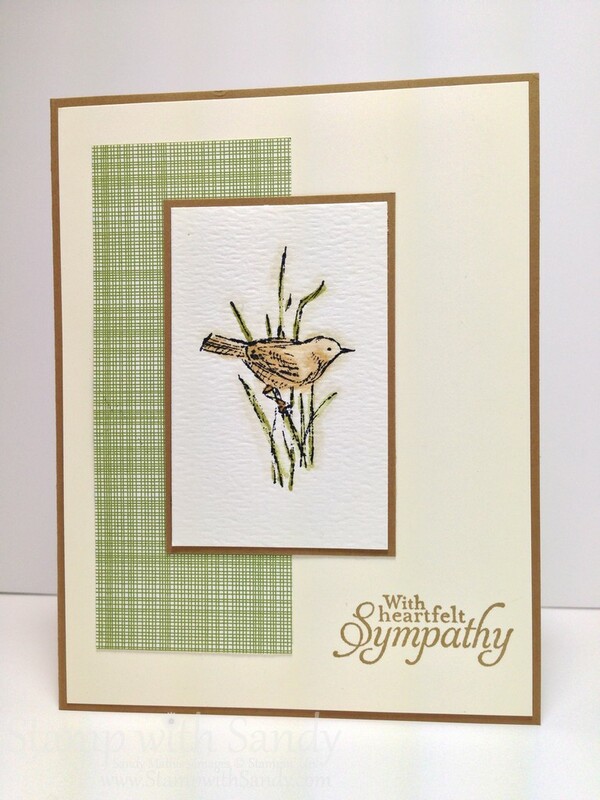 That sweet bird image is so perfect for this lovely sympathy card. Thanks for playing along with CASology this week! I love this watercolored scene. Your card is so soothing. Thanks for playing along at CASology this week. Beautiful watercolouring - very serene! Thanks so much for playing along with us at CASology this week! Simple...but elegant! So soft and lovely. Love love love this card. Beautiful color combination. It will definitely be in my favorite category.